The Four Points by Sheraton Atlanta Airport West is managed by Atlanta-based owner, operator and developer, Hotel Equities. Marriott International, Inc. last week announced the opening of Four Points by Sheraton Atlanta Airport West, Georgia's very first hotel to boast the Four Points by Sheraton brand. Catering to the needs of today's everyday traveler, the hotel offers a unique and attractive design, stylish comfort and all the brand's popular extras including a 24-hour fitness center, heated pool, fast and free Wi-Fi throughout the hotel, and the Best Brews & BBQ™ program, detailed below. The Four Points by Sheraton Atlanta Airport West is managed by Atlanta-based owner, operator and developer, Hotel Equities. The hotel offers 186 spacious guest rooms and boasts more than 4,500 sq. ft. of meeting space to accommodate 400+ attendees. Let us help you plan your next event! Additional amenities include a 24-hour fitness center, business center and fast and free Wi-Fi throughout the hotel. Guests will enjoy full-service dining at the hotel pub and the brand's iconic Best Brews and BBQ program, which serves guests refreshing, curated local beers and seasonal BBQ-style appetizers. Southside Lager from Arches Brewing is the Best Brew at Four Points by Sheraton Atlanta Airport West. 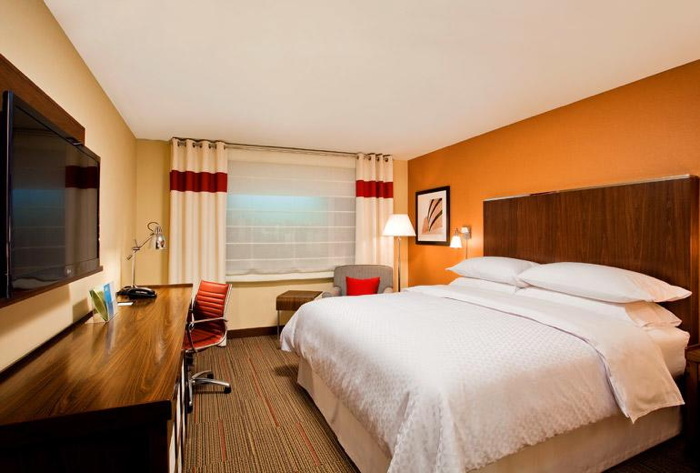 Four Points by Sheraton Atlanta Airport West is just a short drive from the Atlanta Aquarium, the CNN Center, the Atlanta Zoo and the Atlanta Botanical Gardens. It is also within driving distance of the Georgia International Convention Center (GICC) and is located three miles from Hartsfield-Jackson Atlanta International Airport making the hotel an ideal location for business and leisure travelers alike. "Designed with the everyday traveler in mind, Four Points by Sheraton Atlanta Airport West will be a convenient stay for anyone looking to enjoy the world-class attractions of Atlanta," Janis Milham, senior vice president and global brand leader, Classic Select Brands. "Accessible to families and business travelers alike, the friendly design of the property will make anyone's stay comfortable." "We are honored to be an exciting addition to the Marriott International family, by being the first Four Points in the State of Georgia," said Iris Li, owner's representative, Oriental Hotel, LLC. "We look forward to welcoming guests to our hotel and Café Iris, our modern pub, as a destination of choice for leisure and business travelers from all over the world!" Four Points is the most globally distributed brand in Marriott's Classic Select category, boasting nearly 250 hotels in more than 40 countries and territories. The brand has more than 120 signed hotels in the pipeline, with nearly 50% of Four Points' current portfolio of rooms located outside of North America, and over 65% of its signed pipeline expected to open outside of North America. Are you with Four Points? If you are a member of Four Points you may be interested in learning how to optimize your content on our network.